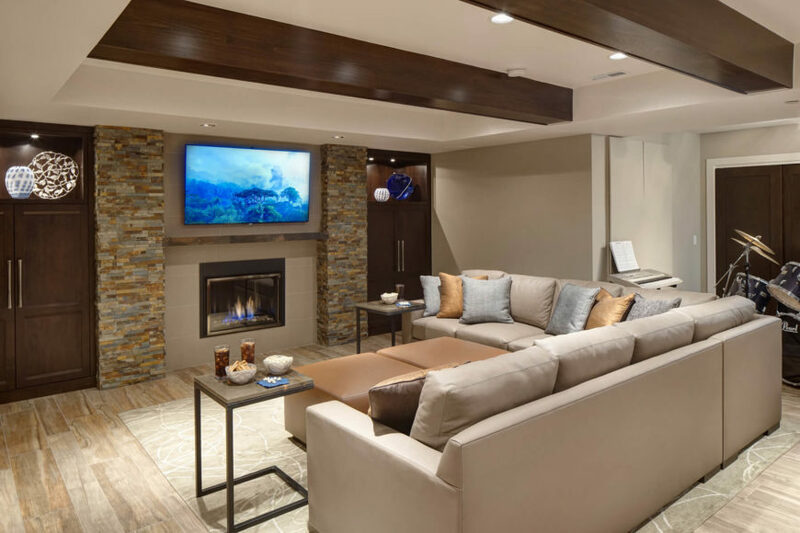 Photo gallery of 13 beautiful contemporary family room designs by the impressive interior design group Drury Design. Welcome to our gallery featuring a collection of beautiful family room creations from Chicago based design firm Drury Design. As the kitchen has grown as a socially important center of family activities in many homes, so often the adjacent family room’s importance has also risen. Usually meant to compliment each other, the family room has become an integral part of a full kitchen remodel. 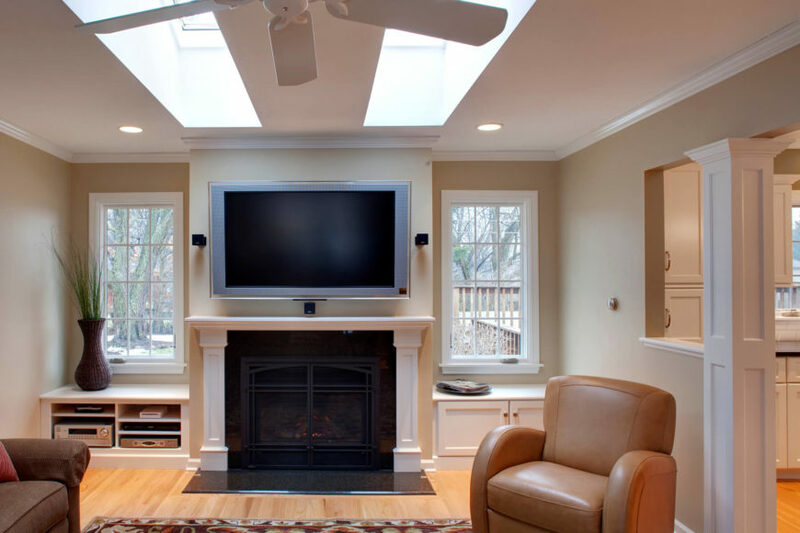 These spaces are often designed together, creating a larger and more aesthetically pleasing living area. 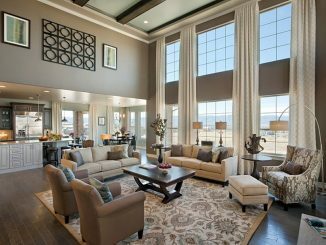 Gathered here are fine examples of grandly comfortable family rooms, specifically created with individual clients’ goals, personal design aesthetic, and lifestyle in mind. 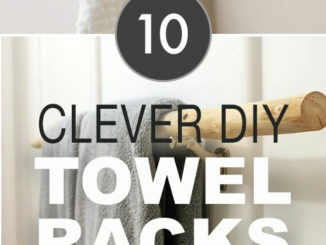 The full breadth of styles and configurations available seems to be limited only by imagination. We hope you enjoy this set as much as we enjoyed putting it together. 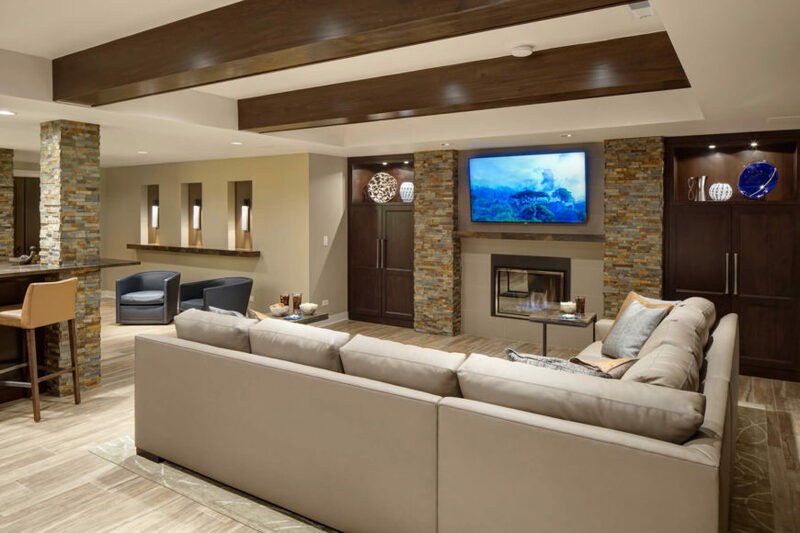 Cozy contemporary family room design with wood flooring and one wall with custom dark wood paneling framing the gas fireplace. The room is entered via white French doors. This room is a nice mix of contemporary and traditional elements. 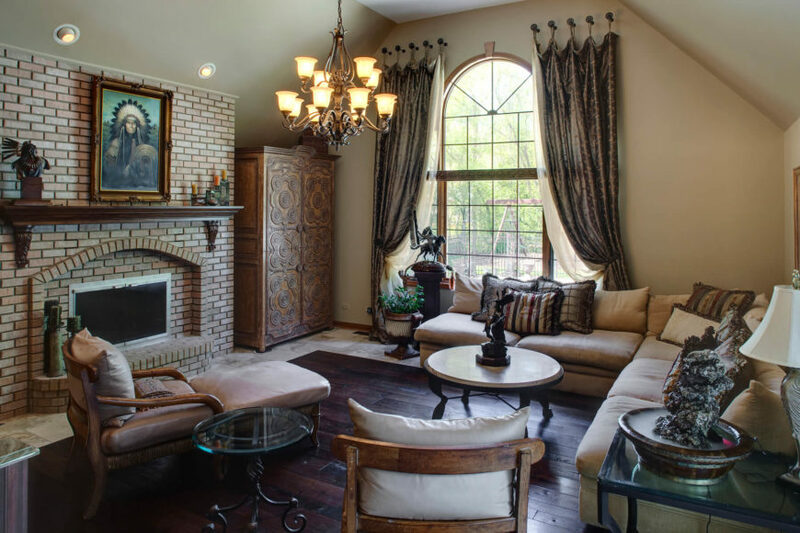 Bespoke luxury informs this cozy family room, framing a rich hardwood floor with tile all around. Large brick fireplace with carved wood mantle commands attention, while an old fashioned chandelier hangs at center in view of an arched, full height window. L-shaped sectional balances a pair of wood framed chairs and circular coffee tables. Lush details and variety of tone abound in this beautiful living room, featuring a detailed white ceiling over beige walls and a rich hardwood floor. 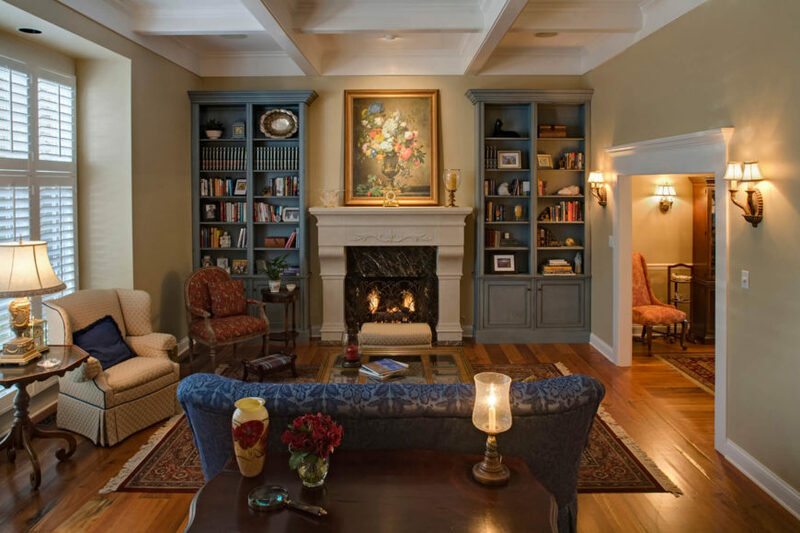 A pair of grey full height bookshelves flank the central stone fireplace, while an array of chairs in blue, tan, and red, respectively, circle a patterned area rug with mirror topped coffee table. 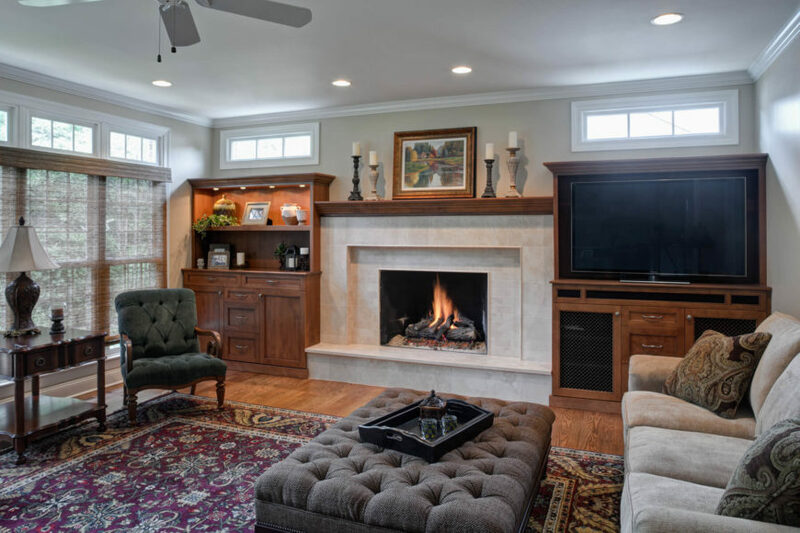 This vaulted ceiling family room features a room-length rich oak cabinetry set surrounding a bold, marble wrapped fireplace beneath rich exposed wood beams. Red and blue patterned area rug over hardwood flooring supports rolled arm seating and a large metal and glass coffee table. 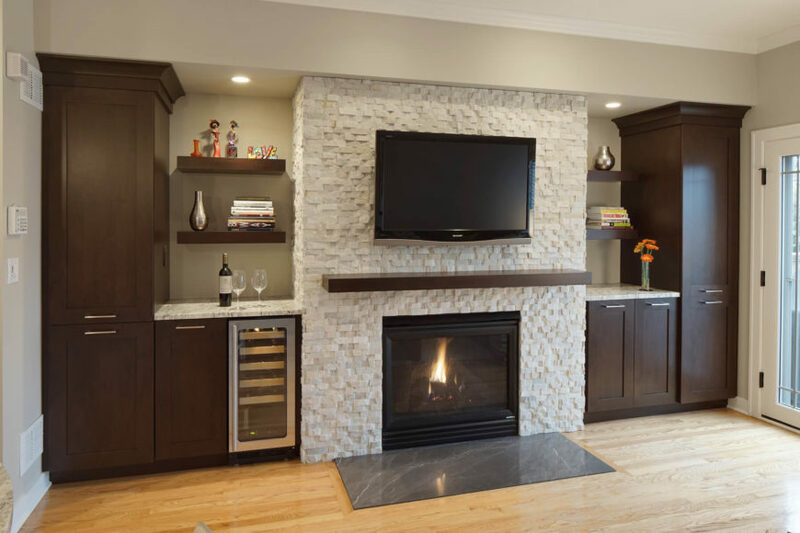 The dark wood cabinetry sports inset lighting, while the set at right sports a small countertop bar area, replete with mosaic tile backsplash. Sharp contrast defines this living room, with dark wood cabinetry flanking a white textured brick fireplace surround, over light natural hardwood flooring. 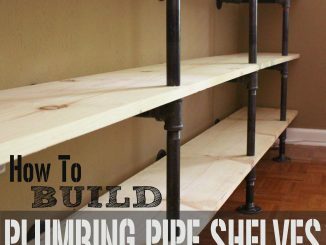 The fireplace stands before a pad of dark marble, while the cabinetry features a built-in wine cooler and marble countertops beneath floating wood shelves. This bright family room opens directly into the kitchen at right, flanked by white carved wood pillars, with light hardwood flooring uniting the spaces. 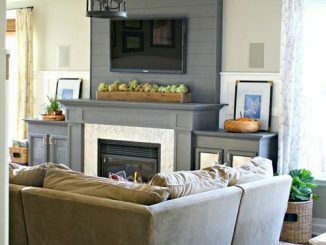 A black fireplace with white wood mantle stands flanked by a pair of recessed windows with full cabinetry and shelving beneath. 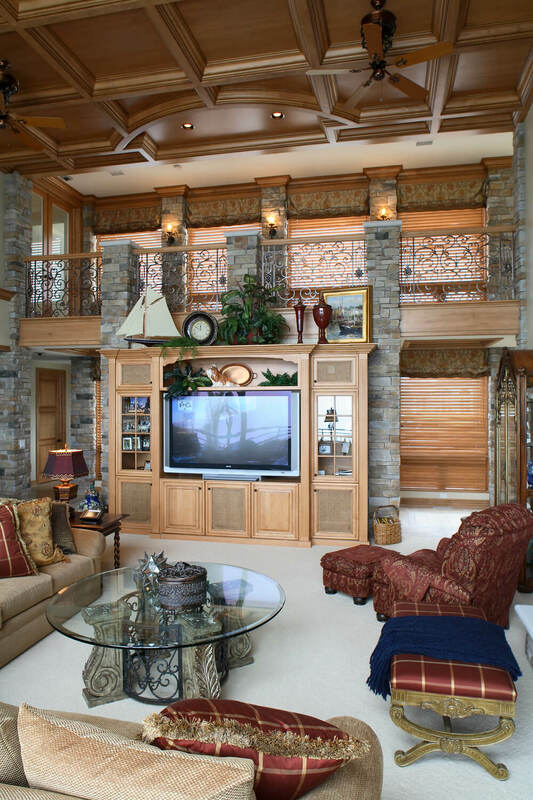 This soaring, two story family room sports lavish detail from crafted wood ceiling, past the iron framed catwalk, down through the stone pillars and natural wood cabinetry. An array of traditional, high textured furniture sits on a white area rug around an ornate, glass topped coffee table at center. 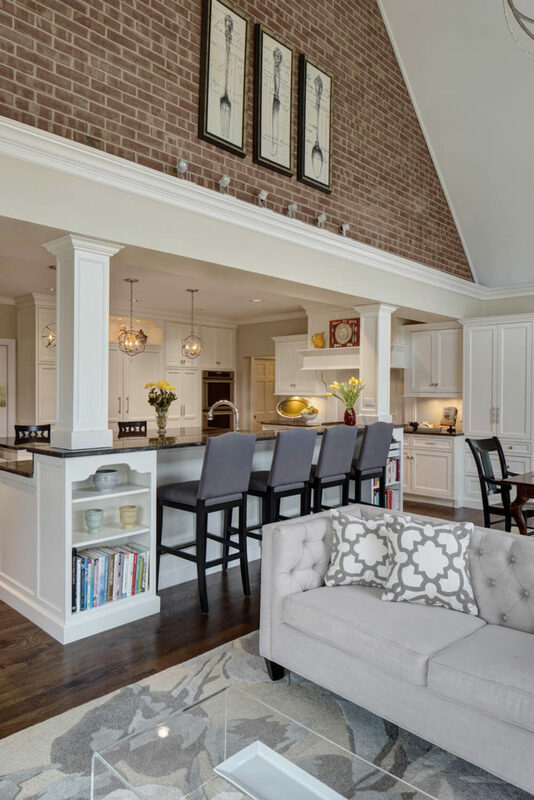 Thoroughly modern family room joins an open space with the kitchen hinted at left, standing light hardwood flooring and a series of stone brick pillars beneath a white ceiling with exposed polished wood beams. 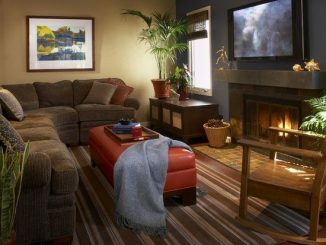 Sharply defined L-shaped sectional commands the center, while rich wood cabinetry flanks a fireplace and television area. The seating area wraps the large leather sectional, holding silver and gold throw pillows, around a pair of cubic tan ottomans. recessed lighting in ceiling and cabinetry subtly illuminates the space. 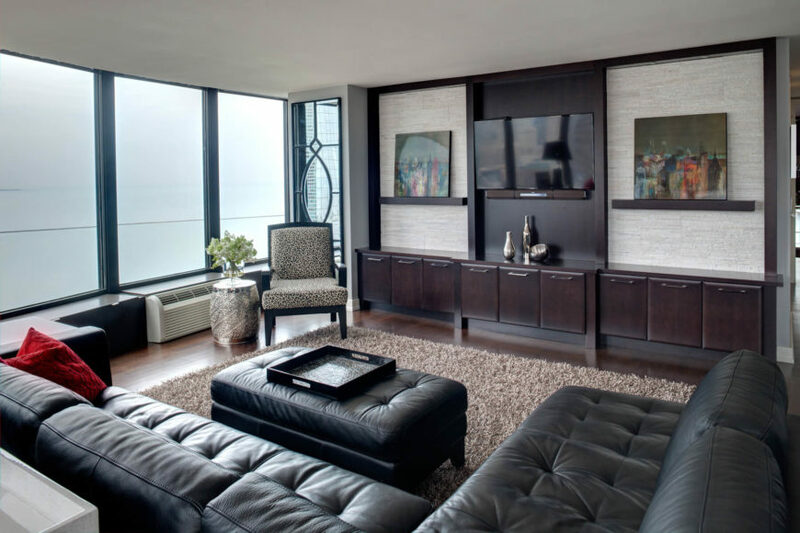 Sumptuous button tufted black leather sectional wraps this family room, flaunting hardwood flooring, dark wood wall-length shelving, and a brown shag area rug. Floor to ceiling windows brighten the space. 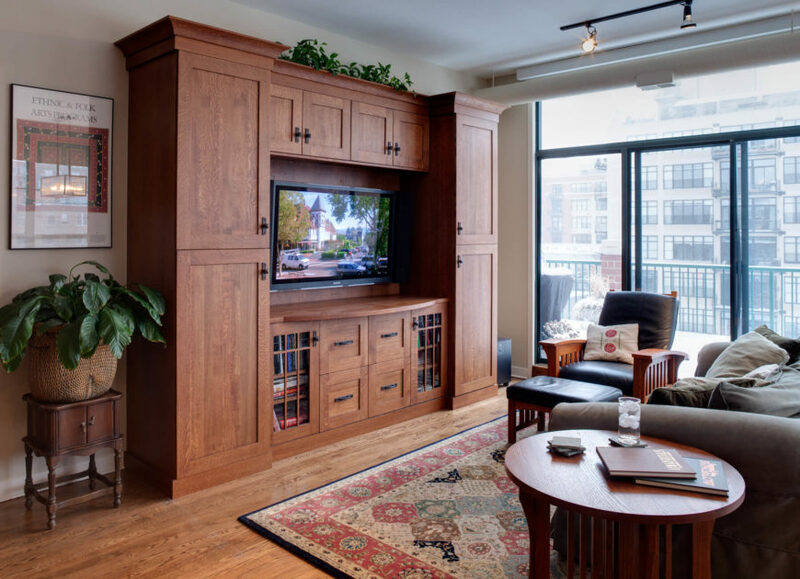 This high rise family room expresses a natural setting with hardwood flooring and warm toned, full height wood cabinetry housing the television at center. Wood framed, leather cushion armchair stands before floor to ceiling sliding glass, allowing for expansive city views and balcony access. The kitchen expands into the open family room space, emerging beneath an immense vaulted ceiling with a red brick upper dividing wall. Rich dark hardwood flooring contrasts with light grey tones on the button tufted sofa, area rug, and bar stools. All-glass cubic coffee table sits in foreground, with built-in island shelving in white behind.